The Templar Mask Great Helm is based on the transitional helms of the Crusades era, particularly those that were used from the 3rd Crusade, on to the 5th. It is particularly noteworthy for its unique design, as well as its use by the legendary Templars. This helmet echoes the look of a great helm, found in earlier Crusade eras, but with a few minor changes that make it a more transitional model in the evolution of the helm. Like the great helm, it features a cylindrical design with a flat top, which is reinforced by rivets and metal bands across the crown. Where this helm differs from the great helm, is that it does not cover the head entirely. Instead, the crown and skull covers the top of the head, while the front face mask, adorned with a stylized cross, wide eyelets, and ventilated holes, covers the face, while leaving the back of the head completely uncovered. The effect is that this helmet is better ventilated, while still providing similar protection from the front! 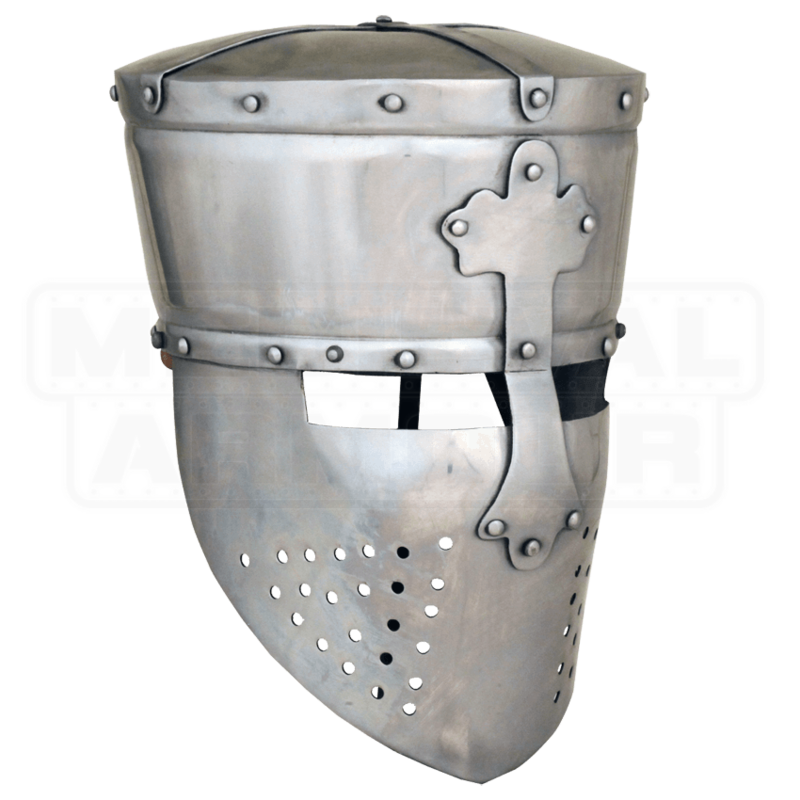 The helmet is made entirely from mild steel, and is offered in two different varieties - the 18 gauge is lighter and suited for casual wearing, costuming, LARPing and light combat, while the 16 gauge is thicker and heavier, being more suited for SCA events, reenactments, and more involved combat practices. 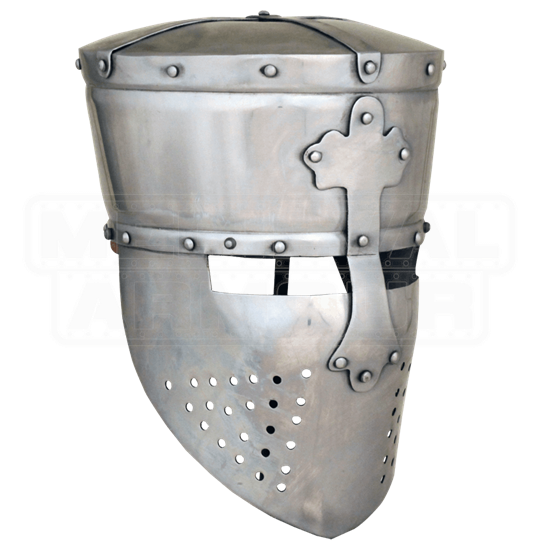 It is a perfect accent for a late Crusades era Templar to wear, and more than that, this Templar Mask Great Helm is also a distinctive piece for any enthusiast to own and display, too.